About us. We are friends addicted to two countries, two cultures that we have decided to share in order to meet other addicted people. These two countries are, of course, South Korea and Japan. How did we come up to this idea? At the beginning, we talked about the association for fun… but we were actually feeling like creating our association… so it started like that! Where does the name “Yaksok” come from? We were looking for a word that fit with both Japan and South Korea. 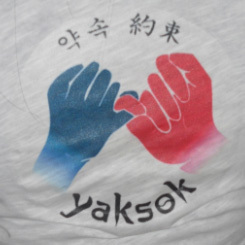 We had several odd names (we don’t want to remind them), and we finally come upon the word “Yaksok” which has the same meaning in both languages: Promise or Rendezvous. 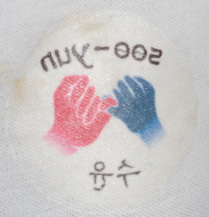 In Korean, the word is 약속 and it is 約束 in Japanese (which is Romanized “yakusoku”). Moreover, this term is very meaningful since it expresses our main goal which is to gather people addicted to these countries. Right after electing "Yaksok" as our association's name, we had to think about our logo. We (almost) immediately came up to the "hands"' idea. Indeed, we often see this gesture in animes or dramas. Regarding the colors, we wanted to have a logo with colors from each flag. That was quite easy since there are only white & red colors in the Japanese flag and, blue, red & white in the Korean one. Moreover, we noticed that blue, white & red colors could refer to France (we are French!)... but this thing wasn't made on purpose. When we decided to launch the association, we thought about its main goals. We have finally chosen to create a Website (homemade!). As a result, we had to select, for each member, what kind of articles he/she could share. Besides, we wanted to have a funny point in order to attract as many people as we could: that's why we started to make a MV parody... for the first time! After 5 months of hard labour (from August to December 2010), we finally succeed! It took us so much time to make it because it wasn't an easy thing to manage to find time for filming (and we had to hope that the weather wouldn't be rainy!). But since we really wanted to do it, we enjoyed it a lot! We tried to be as similar to the real MV as possible. At the same time, our aim - through this video - was to show our character and, of course, our logo! After all, the video was made to promot us. There were so many funny moments before lauching the association! For example, let's talk about our T-shirts. We bought white T-shirts and transfer papers to make them by ourselves. One afternoon, we met to spend our time making them. It took us 40 minutes to make the biggest logo on the back of our T-shirt. We were quite good at doing it. So we tried to gain time and didn't pay attention to the mistake we were doing... Indeed, after finishing our President's T-shirt, we noticed that we forgot to reverse the pictures... Look on the right!